During Pregnancy, extra nutrients (and extra food) is required to ensure the health of the expectant mother, and the unborn baby. Lean meat, poultry, legumes, fish, low-fat dairy. Peanuts, whole grains, yeast extract, sunflower seeds. Sweet corn, broccoli, asparagus, yeast extract, legumes . Fresh fruit – particularly citrus, kiwi, berries, capsicums. Dairy, fish, leafy greens, soy products. Dark-green leafy vegetables, red and other meats, legumes, whole grains. May contain bacteria such as Listeria. Soft cheeses such as brie, camembert, blue-vein cheeses. No more than 300mg per day (e.g. 4 cups of instant coffee). Weight gain during pregnancy should be about 4.4 pounds (2kg) per month. Extra caloric increase should be in the region of 160-170 extra calories per day. Fiber intake should also be monitored. In later stages of pregnancy, constipation can become a problem. Drink plenty of water, and obtain fiber from fresh fruit and vegetables, whole grains, nuts, and seeds. 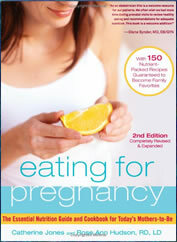 It is quite common to crave unusual foods during pregnancy. While there does not seem to be established scientific evidence that your body requires these foods – it is good to listen to your body. Craving highly sugary, fatty, or salty foods happens to anyone at the best of times – but does not mean we need more of these in our diet! Find some Healthy Recipes Here. i am 15 and pregnant…is this diet safe for sum1 my age?